Mohamed Salah showed off his lightning-quick pace this afternoon, as he tapped home to give Liverpool a commanding 3-0 lead against Southampton. 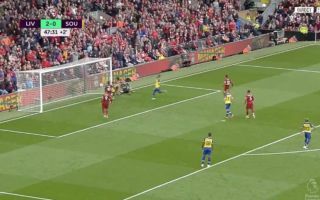 The goal came about after a free-kick from Xherdan Shaqiri rattled off the crossbar, with the ball bouncing on the goal-line, as Salah used his insane speed to beat everyone else to the ball and hammer the ball home. Liverpool fans will most likely see this game as being dead and buried now, and it’ll probably just be about seeing how many the Reds can score from here on out. Here’s a clip of Salah’s strike this afternoon. We’re sure Reds fans are glad he’s as fast as he is after seeing him score this!